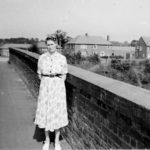 Posted 9 March 2017 & filed under 1940s, 1950s, Places and spaces, Railways, Streets. In 1948, the council tried to get a bus service installed on the Cottonmill estate but the London Transport Executive said they were unable to do so because of the state of the roads leading to the estate. It was reported in the Herts Advertiser on the 8th October 1948 that Cyril Dumpleton, the MP at the time, had said it was important for the schoolchildren to have a bus service. 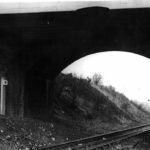 One of the problems was the railway bridge in Abbots Avenue. 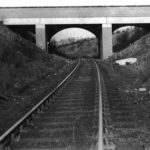 The bridge which spanned the railway to Watford was only a bridge for cattle to go over and so could not take the weight of any road transport. It was also very narrow. So the bridge had to be widened and reinforced before the bus service was introduced. 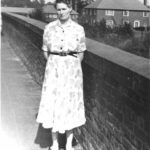 Below are some photos: the first two were taken after the bridge was widened donated by Roger Taylor; and the others were donated by Michelle Mackenzie depicting her grandparents on the bridge in 1954. It looks quite narrow so must have been before it was widened. Houses in Cottonmill Lane and Gorham Drive can be seen. Thanks Sandy. 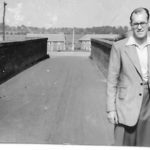 Lovely little piece about the bridge. My brother Terry and i had a so called camp under that bridge (Cottonmill side) in the 50’s. We used to use it a a hideaway. My name is Michael Fuller so if anybody remembers then this would be great.As a child i i would many times under the bridge and watch the trains when i was 7-10 as a child and grew up in 104 cotton mill lane and born 1951.I would love to know if anybody remembers me.